For the cookies: Mix according to package directions, adding the butter, 1 egg and water. Portion the dough to make 20 cookies. Bake and cool following the package directions; set aside. For the macadamia nut ice cream: Pour coconut cream into a heavy-bottomed 3-quart saucepan and place over medium heat. Bring to a low boil, stirring often so the cream does not boil over. Remove from heat. In a large bowl, place 2 eggs, egg yolks, xylitol and salt. Using either a hand mixer or a whisk, beat together until thickened and smooth. Using a ladle, remove about a cup of the hot cream from saucepan and gradually whisk into egg mixture (this tempers the eggs so they wont curdle). Whisking, pour tempered egg mixture into remaining cream in saucepan. Place over medium heat and whisk until slightly thickened, 1 to 2 minutes. Pour into a clean bowl, whisk in vanilla and almond extracts; let stand until custard is completely cooled to room temperature, about 1 1/2 hours. Refrigerate 2 hours, until well chilled, or cover with plastic wrap and refrigerate overnight. Freeze in ice cream maker according to manufacturers directions. Add chopped macadamia nuts 15 minutes before freezing process is complete. To assemble sandwiches: Arrange 10 cookies, top side down, on work surface. 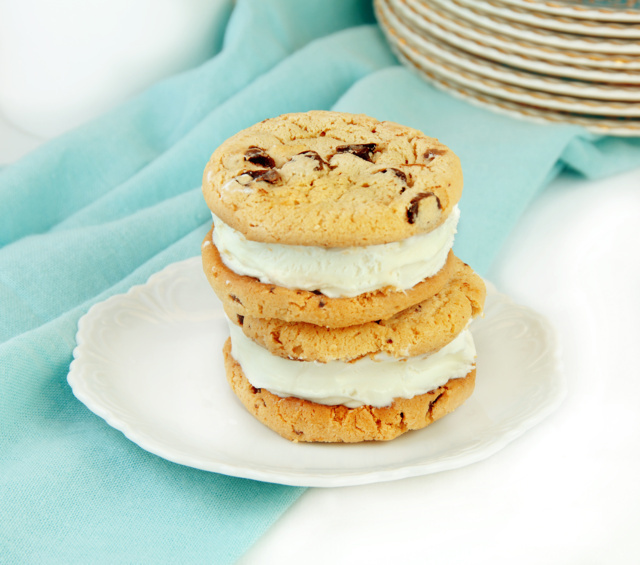 Using an ice cream scoop, working quickly, place 1/4 cup ice cream on each cookie. Top each with another cookie, bottom side down. Wrap each sandwich well in plastic wrap and place in freezer. Freeze at least 4 hours (ice cream will be soft) or overnight (for firmer sandwiches). Can be stored in the freezer up to 1 month.